Hendrick's Head Light sits on the southern tip of Southport Island. 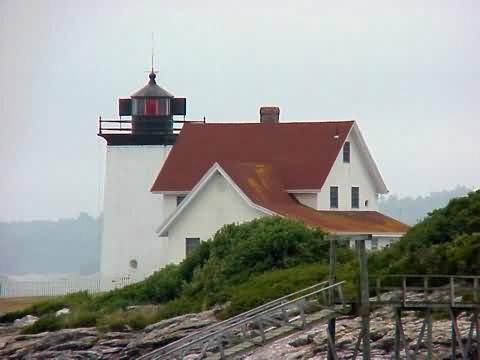 The lighthouse was built in 1829 but its use was discontinued in 1933. But in 1951 the light was used once again. Now the house is privately owned but the light is still an active aid to navigation and maintained by the Coast Guard. The lighthouse is is a private residence at the end of a private driveway. No direct access to the light is available. From Route 1 just north of Wiscasett take Route 27 South. Follow Route 27 through Boothbay Harbor onto Southport Island. In West Southport take a right onto Dogfish Head Road and an immediate left onto Beach Road. Take Beach Road to the public beach and parking area. The lighthouse will be off to the right side of the beach.